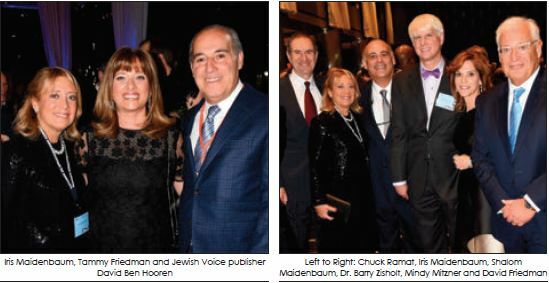 The Zionist Organization of America (ZOA) held its annual gala at the Hyatt Hotel on Sunday November 12, 2017 with a VIP cocktail reception and press conference starting at 4:30 PM. Mort Klein, President of ZOA, fielded questions from the New York Times and CBS News with one outlet questioning whether he was ambivalent about inviting Steve Bannon who has been purportedly embraced by white supremacists and neo-Nazis. Klein insisted that such accusations serve as “a horrific character assassination of a good man,” citing Bannon’s inability to control his more extreme supporters. “Reagan had Nazis supporting him, so what?” Klein said, according to a Ha’Aretz report. Klein recalled Bannon asking him three months ago if he could introduce honorees Sheldon and Miriam Adelson and reiterated there was no one who was a more fervent supporter of Israel than Bannon. Klein said Trump’s desire to make a deal with the Palestinians was impossible since Abbas only wanted to see the destruction of Israel. Klein is considered one of the great modern Jewish activists after being elected National President of ZOA in 1993 and reviving the moribund 120-year-old organization to become one of the most pivotal groups in the American Jewish scene. He is a child of Holocaust survivors and was born in a displaced persons camp in Germany. Klein is also a renowned economist having served in the Nixon, Ford and Carter Administrations. Last week he testified before Congress as to the importance of moving the U.S. Embassy to Jerusalem and we were shown film of his testimony. Tonight Klein outdid himself with a superstar cast of participants including Steve Bannon, Sebastian Gorka, Senator Joe Lieberman, Senator Tom Cotton, Ambassador David Friedman, Sean Spicer, Alan Dershowitz, and Christopher Ruddy. After the national anthem was played via trumpet by the spectacular Michael Lington, Klein gave a riveting speech saying that we would “never again” be Jews of silence. Klein noted some of the major achievements of ZOA including its opposition to the Oslo accords, getting Congress to change the interpretation of Title 6 of the Civil Rights Act to include Jews, and preventing anti-Israel bigots such as Joe Zogby and John Roth from attaining positions of power. He also lauded the accomplishments of Israel including maintaining more patents than China, Russian and India combined with more scientists, Nobel Laureates and musicians per capita than any other state. He remarked that Orthodox Jews comprise more than 40 percent of the offices in the Army. He hailed Israel for bringing black people in as citizens. Klein gave one of the most articulate speeches in memory and honoree Joe Lieberman remarked that as Klein gets older he gets more spirited and passionate. 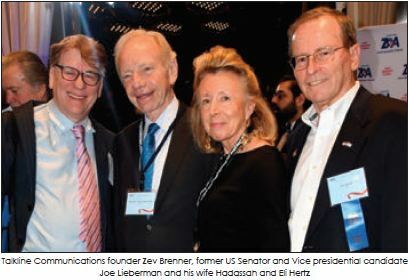 Sunday night’s honorees Iris and Shalom Maidenbaum thanked the ZOA and Klein for fighting for Israel with Shalom remarking he only agreed to be honored because of his friendship with Ambassador David Friedman who was being presented with an award. Friedman spoke of support for Israel being a “quintessential American value.” Friedman, US Ambassador to Israel, said he came into office following the greatest betrayal of Israel by any sitting U.S. President; referring to the failure of Obama to veto UN resolution 2334-which demanded a halt to all Israeli settlement construction in the West Bank and East Jerusalem. “I hope you agree we have turned a page,” remarked David Friedman, citing the recent withdrawal from UNESCO by the Trump administration and “new sheriff in town” Nikki Haley. He also noted for the first time ever a Yom Ha’atzmaut celebration was held in the White House with Mike Pence leading, and that President Trump was the first sitting President to visit the Western Wall. Friedman stated there was no daylight between Israel and the US in terms of the desire of the Trump administration to rid Iran of its nuclear arsenal and stop it from sponsoring terrorism. He also said it was not a question “if ” President Trump would move the embassy to Jerusalem but “when.” He said President Trump was aware of Friedman’s commitment to Israel when he formally nominated him on the first day of his inauguration. Friedman recounted all the senior Cabinet members he has met with, manifesting the U.S. appreciation of Israel as a critical ally. Another great advocate of Israel and Donald Trump, Alan Dershowitz spoke about the dangerous move of the right to the far right and the left to the far left. He decried “Black Lives Matter” for its platform which labels Israel as “genocidal” and “an apartheid state.” He said he continues to remain a Democrat to fight the anti-Semitism from within the party while acknowledging conservative republicans have been more effective at getting rid of Anti-Israel members. He gave the Mort Zuckerman award to Christopher Ruddy, the CEO of Newsmax Media. Chris Ruddy called Dershowitz “the Jewish mother he never had” and remarked on his “hero” Alan Dershowitz who has stopped throwing cocktail parties in order to advocate for Donald Trump in the highly biased Russian investigation. Ruddy called himself a Christian Zionist and said Mort Zuckerman could not attend but his endorsement of Romney in the 2012 election in the liberal “Daily News” was indicative of his love for Israel as he viewed Obama as a threat to Israel. Another “Christian Zionist”, Steve Bannon, who is no fan of Obama’s was introduced by Congressman Lee Zeldin and emcee Rita Cosby. Bannon was the star of the evening with reporters and admirers congregating around him the entire evening as security stood nearby. Bannon said he did not miss his time in the Trump administration preferring to advocate from the outside at Breitbart. Bannon’s mesmerizing charisma keep him in the political spotlight despite not having an official title. Tonight he spoke about the night of the election with “the opposition party” (the press) predicting double digit landslide losses for President Trump until 2:30 AM when the Associated Press called the election for Trump. According to an Ha’Aretz report, Bannon appealed to the ZOA dinner attendees to “work as partners” in his crusade against GOP leaders he blames for blocking Trump’s agenda. Bannon delivered the firey address while seizing the opportunity to punch back at the GOP, according to the Ha’Aretz report. “We’re leading an insurgency movement against the Republican establishment,” Bannon charged, blaming his adversaries in the establishment for playing games. “We have a long dark valley to go through, folks,” said. He added: “Iran, Turkey, Hezbollah, Hamas, the Muslim Brotherhood, the Middle East right now is on a knife’s edge… The pressure President Trump is under in Washington, DC, as the radical Left tries to nullify — and they’re trying to nullify – the 2016 election… President Trump needs our back… because we’re a nation at war and this war is only going to be won if we bind together and work as partners.” As keynote speaker at the dinner, Bannon was making one of his first public appearances since being forced out of his position as Trump’s top strategist a few weeks ago, according to a JPost report. The Trump administration, both past and present, was well-represented at the dinner. Bannon unabashedly declared that Donald Trump is the finest candidate for our nation’s highest elective office and is the strongest supporter of Israel since Ronald Reagan as well as one of the greatest public speakers since William Jennings Bryan. He said Trump’s victory wouldn’t have come without Sheldon Adelson’s council, wisdom and guidance. Bannon said Adelson’s wisdom helped Trump when the Access Hollywood tape emerged and the world turned against him-unfortunately the Adelsons couldn’t attend the dinner. Bannon recalled President Trump deliberating over his inauguration address where he promised to wipe Radical Islamic terrorism from the face of the earth knowing his speech would be studied 100 years from now. Bannon said in 2014 ISIS had 8 million people under its reign and in the first 9 months of his administration Donald Trump destroyed them-something the “opposition party” credit to Obama. Bannon reiterated his admiration for Mort Klein and his unapologetic defense of Israel. He called on the US to destroy the Iran deal and said, “It is time for us to act and I believe the only way to act is not through moderation, I am not a moderate I am a fighter.” He said as a Christian Zionist he was proud to stand with the state of Israel one of the greatest nations on earth. He concluded by calling for help in fighting the war waged by the radical left against Trump who continue to try to nullify the results of the 2016 election. 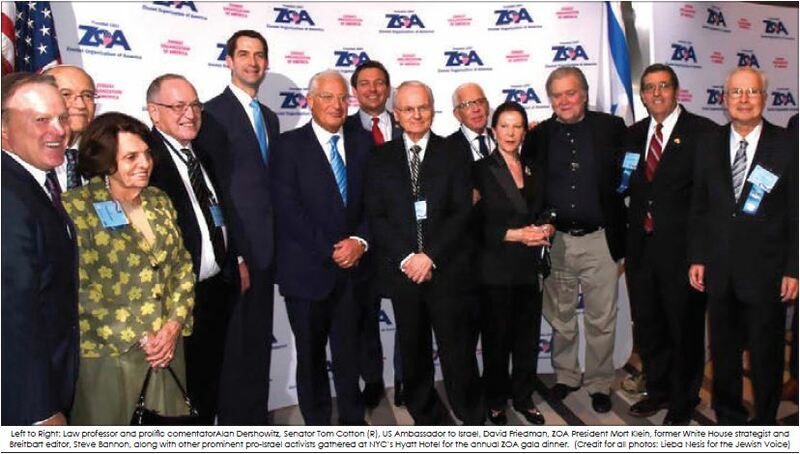 At the conclusion of his speech Bannon received a standing ovation and headed to his table, instead of leaving as most prominent attendees do, to hear Senator Cotton speak of his staunch support of Israel and reiterate that the capital of Israel was Jerusalem. This dinner was one of the few I have attended without a fundraising portion or auction which was a welcome relief. As guests headed to the Viennese table outside The Ariel group sang Adon Olam-a fitting conclusion to a uniquely important evening.